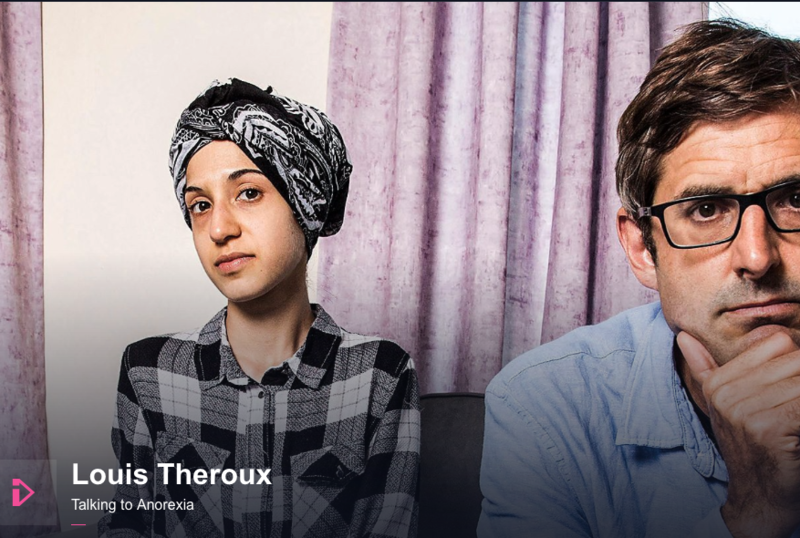 If my Twitter feed was anything to go by, I was not alone in being curious/anxious about if and how Louis Theroux would manage the sensitive complexities of Anorexia Nervosa. An illness which is subject to many myths, assumptions and stigma, the challenge was to deliver and to avoid the traps so many other programmes have fallen into. Louis employed his unique semi-naïve inquisitiveness to sensitively ask the questions that you’d expect a layperson to ask when seeking to gain a better understanding. His genuine empathy and compassion for the pain and suffering of those affected by Anorexia, including their families, was palpable and emotional to watch. The programme predominantly followed the journeys of Rosie, Jess, Ifsana and Janet, all of whom were extraordinarily brave in their candour; sharing their most private thoughts, emotions and personal battles. My Twitter feed once again provided a steady flow of feedback ranging from shock, sympathy, compassion and disbelief around the stories and statistics talked about. Visiting St Vincent’s Outpatient Unit and St Anne’s Hospital Phoenix Wing, which a patient described as 'prison' and another as having a 'military' approach to treatment, the programme swiftly delivered the clear and vital message that Anorexia is a powerful, destructive, life consuming and sadly, life-threatening mental illness. It provided a fairly balanced narrative about the complexity of the illness in respect to the physical risks associated with the symptom of being dangerously underweight and the devastating impact on a person’s cognitive processing, emotional coping, as well as social and daily functioning. The programme helpfully conveyed the message that Anorexia is more than fussy eating/not eating or, indeed, to do with eating at all. Louis attempted to explore the reasons why people develop the disorder, which included a clinical explanation proffered by Dr Frances Connan; biological predisposition (certain personality traits which increase an individual’s susceptibility) and a combination of environmental factors. Perhaps more helpfully the ladies featured offered their own insightful understandings of origin and maintenance including; a form of self-punishment, fears of maturation, anxiety management (through seeking, exerting and having control) and a functional coping mechanism to cope with emotions such as guilt and shame. Jess so eloquently stated that 'people don’t get it' and that 'it’s not about attractiveness'. Hopefully this has gone some way to helping shut down this common myth. Furthermore some of the confusing and complex psychological constructs associated with Anorexia, which both exacerbate and maintain the disorder thus impacting on recovery, were considered, including; pocrescophobia (fear of gaining weight) and anosognosia (the lack of insight that a person suffering from a disease has about their condition). Louis accurately surmised that the disorder is one full of paradox and contradiction; the emotional, cognitive and physical pain of oscillating and battling between recovery and illness. Things that were done less well include the total bias towards females. It has long been a struggle to get the world to acknowledge and validate male eating disorders and it was a shame that aside from a glimpse of one male patient this was omitted; a real missed opportunity. Furthermore, there were some unhelpful features including focus on weight charts (including a clear view of a patient’s lowest admission weight), shots of snack lists and portion sizes as well as showing before and after pictures. I have no doubt this programme would have been significantly triggering for those battling their own eating difficulties and I noted that Beat (the UK’s leading Eating Disorder Support Charity), along with many others, provided a sterling and necessary presence across social media platforms offering help, advice and support for those struggling to watch. It may have been prudent to prominently feature someone who has achieved full recovery to instil hope that this is absolutely possible and achievable. Of course one must remember that this programme’s target audience was the general public, not mental health professionals or indeed those with eating disorders – and inevitably it could only cover so much in one hour. If the programme has increased awareness and promoted understanding which leads to greater compassion then this is a good thing. The most powerful statement by Louis, and one I echo wholeheartedly, was in response to Jess talking about anoretic behaviour as a 'shameful secret'… Anorexia is an illness, to which no shame should be attached. Watch the programme now. Find more Louis Theroux in our archive.